Good news for KISSATEN fans!!! 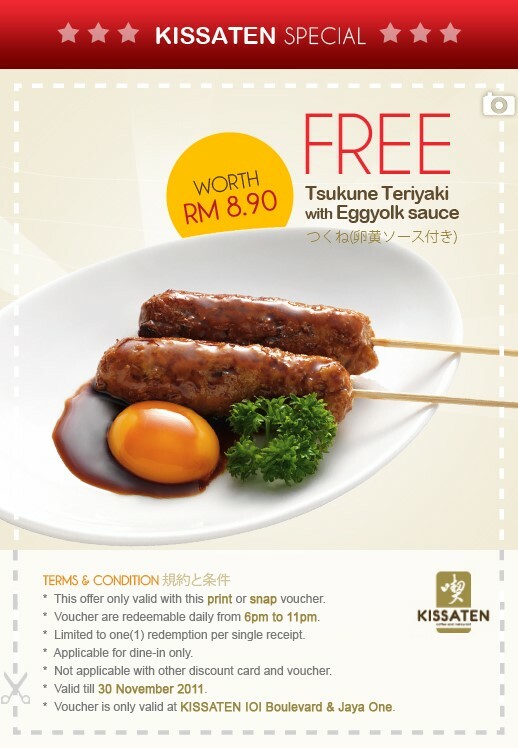 Do you want to get a FREE Tsukune Teriyaki with Eggyok sauce worth RM8.90? It's easy! Just print or snap the below voucher and redeem it at KISSATEN IOI Boulevard & Jaya ONE. This offer only valid with this print or snap voucher (visit & "like" KISSATEN facebook to get this voucher). Voucher are redeemable daily from 6pm to 11pm. Limited to one(1) redemption per single receipt. Not applicable with other discount card and voucher. Valid till 30th November 2011. Voucher is only valid at KISSATEN IOI Boulevard & Jaya ONE. Visit KISSATEN facebook page to get this voucher now!